uuid : 05f13d64-fd82-4fe9-9965-4db052c2c213 templates_id: 119474 templates_uuid: "73c8764b-7050-44be-9b33-6d8ba38e261f" title: "Terms and Conditions Supply of Services to Consumers via Website" display_name: "Terms and conditions for supply of services to consumers via a website" meta_keywords: "T&C\'s for supply of services B2C via website" description: "
Protect your business with clear and fair terms and conditions for supply of services to consumers via a website. Use these terms and conditions for any business in England & Wales that sells online services to consumers. They are designed to be straightforward and comprehensive so that customers know where they stand and needless disputes can be avoided. They cover key issues such as orders, supply, customer responsibilities, pricing, payment, data protection, guarantees, liability, cancellation and termination. What are terms and conditions for the supply of services via a website? Terms and conditions for the supply of services via a website (also known as T&Cs) should be used if you want to supply services online to a consumer on standard terms. They should cover key issues such as orders, supply, customer responsibilities, pricing, payment, data protection, guarantees, liability, cancellation and termination. Why do I need terms and conditions for the supply of services via a website? Terms and conditions for the supply of services via a website protect your business interests, ensure that customers know where they stand and help avoid disputes. How do I implement terms and conditions online? Terms and conditions must be clearly brought to the customer\'s attention before the contract is made to ensure that they are binding on the customer. There are various ways of doing this. Usually customers are deemed to accept the T&Cs by placing an order. However the best way to ensure that the T&Cs are accepted are by requiring the customer to check a box stating that they accept them before the order is placed. Ideally the tick box includes the terms and conditions or a hyperlink to them allowing the customer to store and reproduce them at any time. The consumer has a statutory right to cancel the services within 14 days from entering into a service contract. If performance of the service has already commenced the consumer still has a right to a refund but only up to the difference between the value of the service provided and the point in which the contract was cancelled. For example a gym membership could be cancelled and refunded but the consumer could still be charged for the amount of time they used the facility.
" created_timestamp: "2018-10-08 04:36:12.0" modified_timestamp: "2018-10-08 04:36:12.0" active: true created_by: 236 modified_by: 236 dcm_id: 208 url_slug: "Terms-and-conditions-for-supply-of-services-to-consumers-via-a-website" meta_description: "Create terms and conditions for supply of services to consumers via website with simple guidance from Rocket Lawyer. Protect your business with these standard terms and conditions for online services. Try this free terms and conditions template. " time_to_complete: "20 minutes" role1: "Service provider" role2: "Buyer"
Terms and conditions must be clearly brought to the customer's attention before the contract is made to ensure that they are binding on the customer. There are various ways of doing this. Usually customers are deemed to accept the T&Cs by placing an order. However the best way to ensure that the T&Cs are accepted are by requiring the customer to check a box stating that they accept them before the order is placed. Ideally the tick box includes the terms and conditions or a hyperlink to them allowing the customer to store and reproduce them at any time. More than just a Terms and conditions for supply of services to consumers via a website template, our step-by-step interview and guidance makes it easy to create your document. Easily create online, download, print and sign your free Terms and conditions for supply of services to consumers via a website in minutes. 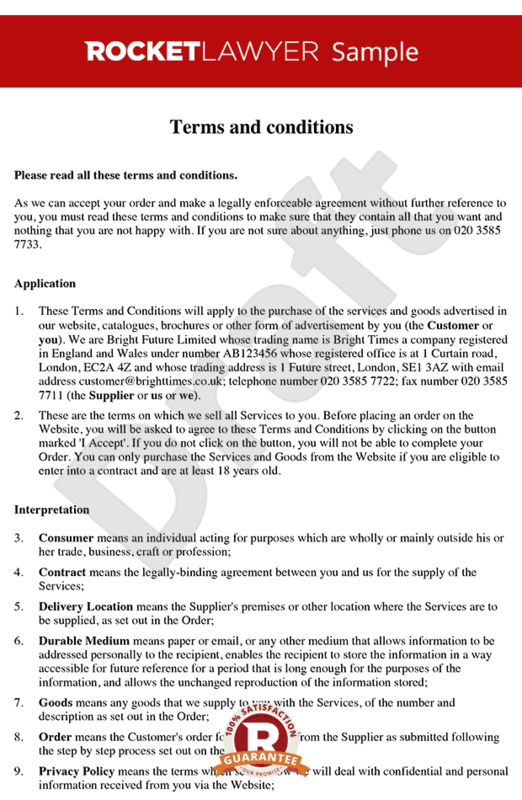 This document is also sometimes called: T&C's for supply of services B2C via website.